Yesterday afternoon it so happened that there was a football match on the telly that my husband wanted to see. We don't have the sports channel in our house so my husband wanted to watch the match in a local Pub. He asked me if I would go with him. Hmm... not being a footie fan, I looked at him sideways - but then considered that what ever people there were in the pub were going to be glued to the screen. Perhaps, this was the perfect opportunity I needed to sneak in a sketch without being seen...? 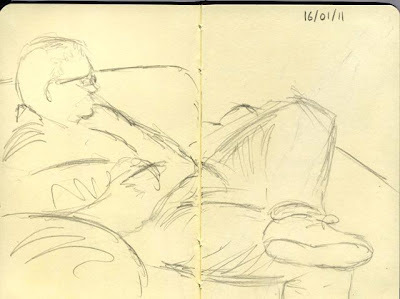 Anyway, the pub was quite, we had a nice dinner and afterwards I took out my inconspicuous sketchbook and began sketching a man engrossed in the match. He was moving around a little, but nothing that hindered me too much. 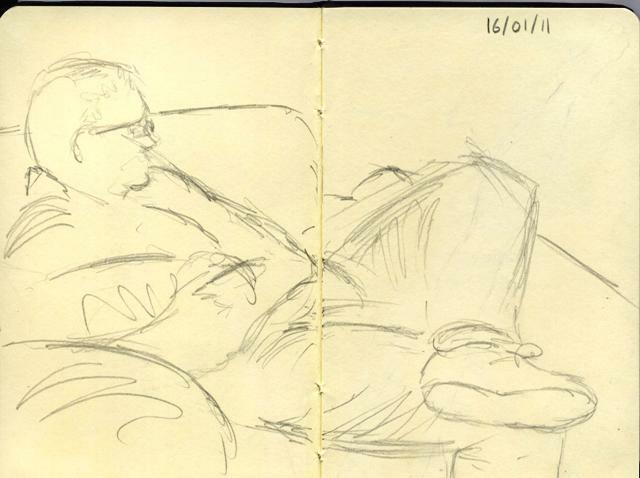 Well done you and the sketch is just marvellous it captures a man engrossed in something. Made me laugh because i cannot understand how serious people take football. A load of boys and I use that term lightly running about a pitch chasing a white ball and it becomes life and death and for two hours they get paid thousands. See your sketch worked. The sketch is great! And good for you to overcome your fear! I painted outside in a group many years ago so I can relate to your feeling uncomfortable. I was glad I wasn't alone. Yeah you go girl. Definitely a HUGE pat on the back for getting out there and doing it. Great result too!!!! I try to sketch in public too. I carry a moleskine sketchbook in my purse. The weird thing is... every time I settle into a spot, choose my subject and really get into my sketching... somebody plants themselves right in my line of vision, or the subject leaves, etc. It really forces me to work fast! Which is good for me! Your sketch is good. You got all the important elements nailed down. Keep it up! It is wonderful Sandra! Really it is. It looks very spontaneous and confident too. I can't imagine that you were nervous by looking at this sketch. I'm still a little nervous to sketch in public, I've always been like that. I used to really hate it when my husband stood over my shoulder to watch me paint. I was so scared that I would mess up and he would see me fail and blah, blah, blah. Anyways, I guess with anything practice helps. I'll be looking forward to seeing more, it's really fantastic! Hi Sandra, I never did sketches in public, so I can imagine how you can feel!! Anyway, you did a fantastic sketch, very free and spontaneous! Congratulations! Brava Sandra, in public I block! Well kudos to you for your bravery Sandra. It's been quite some time since I sketched on location. I used to find it easier to go with fellow artists, that way it was less stressful when members of the public got inquisitive. Great Sandra! I think this is the right way. The results it's good. Well done. I remember the first outdoor sketch : i felt a little bit of discomfort, but i did. Time after time we get more certainty. Hi Sandra! What a wonderful sketch, and in just 5 minutes! It's difficult to sketch people in a very short time, and even more do so in public! I, too, was very scared at first, and still a bit am I at times, but now I'm much more confident, and a lot less aware of the presence of others when I sketch. It is all about practice! I also find that the lighter sketch kit is certainly more suited to win not only fear but also the problems caused by sketching outside. I always carry in my bag an A5 sketchbook , with a waterproof pen, and a mini watercolor box... and so I am able to do some sketches, even if sometimes the major problem is the lack of time! A hug! Hi sandra, congrats on starting to overcome that fear. I can totally relate as it is something i just cant do. I've always admired the street portrait artists you see in European cities as i could never do that. We're going to Skye for a week in Feb and i'm def taking my sketchbook with me to try some actual live subject/outdoor sketching! It's a great sketch you did by the way and i'll look forward to seeing more. Hi Sandra, congrats on a great sketch. Have you tried the water color brushes that hold water? I forgot the name, the brush holds water in a like a fountain pen,they are easy to use,inexpensive and perfect to use with watercolor pencils when you are sketching on the go! Há muitos anos eu pratico desenho e faço pelo menos um "sketch" por dia. Esse "sketch" eu assinaria com orgulho pois está muito bom. Sandra você é uma excelente desenhista. Sandra você é uma ARTISTA! That's a great sketch. Sometimes the good stuff comes so quickly. Take it from me, sketching in public is actually a lot of fun! you have to remember, that 'regular' - meaning non-artistic people who can't draw anything at all.....seem to be greatly enthralled by artists..and like to sneak peeks now and again! "are you guys REAL artists? ".....I find those to be some of the most precious moments! anyhow...I did finish and post about my fruity sketch...it's a few scrolls down on my main page now....you'll have to come and look for it and let me know what you think! I do remember the first time - and its enshrined on the school video for all time. The Glastonbury Thorn.. and me as an eleven year old sitting on grass, anorak hood pulled over head.. Crystal - I can really relate to how you feel when your husband looks over your shoulder. I am exactly the same! I find myself feeling almost ashamed of my artwork, which is strange because he's the last person who would want me to feel like that! Frank - I know what you mean! It's not the act of sketching in public, or even being seen that worries me - It's the thought of somebody looking over my shoulder - I would be SO embarrassed! Carmelina - How wonderful that you and your husband can share your hobby! That must be so nice! Somebody asked if I was an 'actual artist' when I was out sketching with Sue. I opened my mouth to say, 'Oh no, not me', but before the words could come out, Sue said 'Yes, of course'! Though I saw Sue as a 'real artist' I never saw myself that way. She made me feel more confident in that one moment than i had ever felt! PS - I am on my way to your blog right now!!! Like your sketch and thank you for sending me to Carmelinas' wow ! is all I can say. I'm in heaven.!!! good for you sandra ... you're good ! last time i really enjoyed sketching people in public was in an airport waiting for a plane ... really quick sketches pen and pencil with a pocket size sketchbook ...i love sketching on location....i think in time and the more you do sandra you're feel happier about it. It's always a challege to paint/draw from life,..nice work!